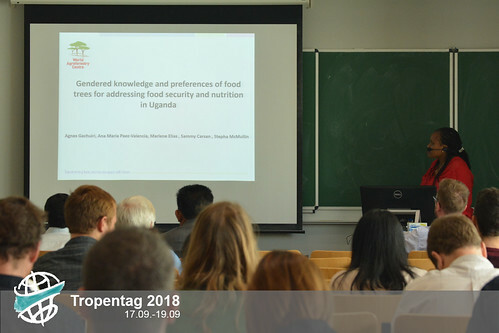 To understand the knowledge and preferences of the farmers ICRAF wanted to investigate which species are ecologically adapted to local conditions and also which are seasonally available to fill specific food insecure periods and “nutrient gaps” in diets. The research was carried out in two districts in Uganda, taking into account the gender and age-related needs. A total of 36 trees were identified, and curiously, the older woman identified the most, followed by younger woman. Young men were the ones who identified the least amount of native and seasonal species. Why? The main reason was that the older women worry about the availability of children´s food. In the session, we get to know some of the commonalities and differences in preferred species. For old and young females, the main factor was the availability and function of nutritious food, for example, guava played a main role in one of the interviewed communities. For young females and males, the preferred species are the more marketable crops, such as the passion fruit, due to its market profitability and juice making applicability. While for older men, they preferred fruit trees species such as avocado because of the good income and other uses, such as charcoal, shade, and timber. the woman, again the reason centered around child nutrition. But what happened with fruits such as mango and avocado? They seem to belong to the exotic fruit group, just as the passion fruit is. However, these are not the only key aspects that are taken into consideration by the farmers, but also the taste, medicinal value, and opportunities in the market. The income generation is an important reason, nevertheless, when food and nutrition security come into question, there is a need into advice women and men about the importance of fruit trees in terms of nutrient values.